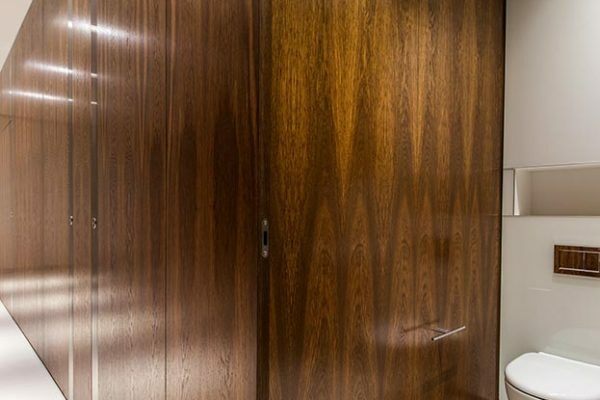 The new washrooms we created for this sophisticated office development in the heart of Mayfair were designed to blend classic and contemporary styles seamlessly, reflecting the building’s new unique interior design. The striking new retail and office development at 7 Clarges Street has been led by led by world-renowned architect Squire and Partners and coordinated by Laing O’Rourke for British Land. The development comprises bespoke office accommodation inspired by the established Mayfair streetscape as well as British tailoring and craftsmanship. The façade uses Portland Stone with hand carved fluted stone columns and bronze framed windows and balconies, whilst fully glazed openings at street level offer views into the reception area, designed as a gallery space in which bespoke commissioned furniture and artworks are displayed. 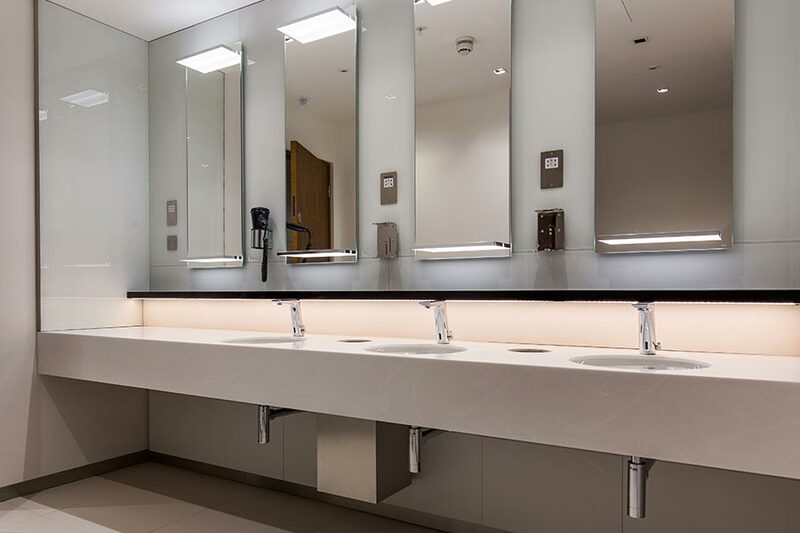 The high quality finish was incorporated throughout the building and we worked closely with interior fit out contractor SJ Eastern to ensure the new washrooms met the high specification bespoke finish required. 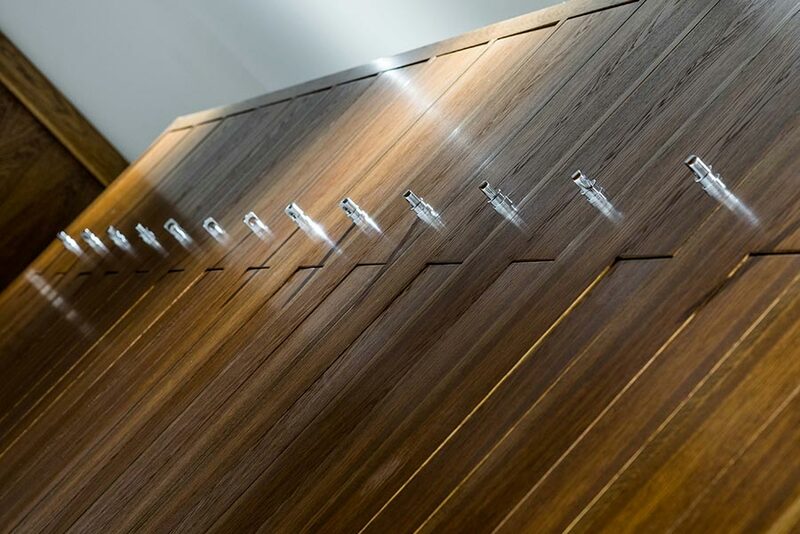 The washrooms are a continuation of the interior design theme and feature stunning oak veneer to complement the rest of the building as well as high specification luxury staff shower facilities in the basement. 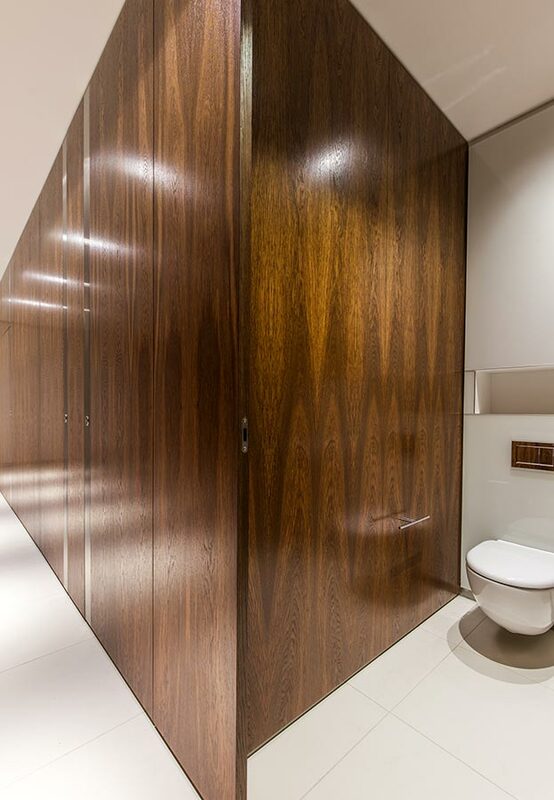 Our full height Alto toilet cubicles and pilasters were both finished in real wood dark oak veneer, chosen to complement the wood used in the reception area and other common areas. 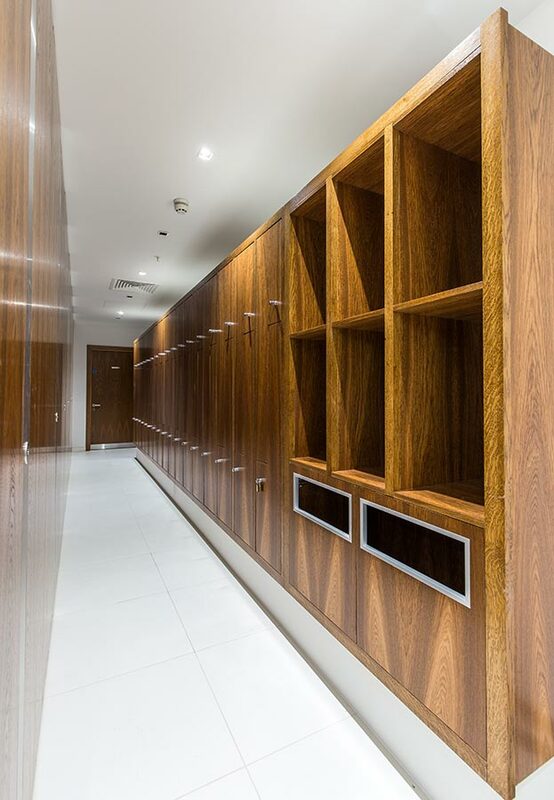 The rebated edges of the Alto cubicles create an attractive flush front façade and together with the full height, real wood veneer finish and matching pilasters adds to the high specification design. Our Concerto integrated duct paneling system was faced with toughened back painted glass to create a seamless finish. As well as being easy-to-clean, the duct panel system also allows ease of access for any future maintenance whether planned or reactive and creates a neat and tidy appearance in the washrooms by concealing pipework. Completing the washroom design are the bespoke white Corian vanities complete with sensor-operated taps, integrated waste bins and bespoke Corian recessed duct bag shelf above the sinks in a contrasting colour. Solid surface Corian, which as well as being extremely durable lends itself to being cut, bent and joined to produce a seamless smooth finish offers the perfect balance form and function making it ideal for busy commercial washrooms. 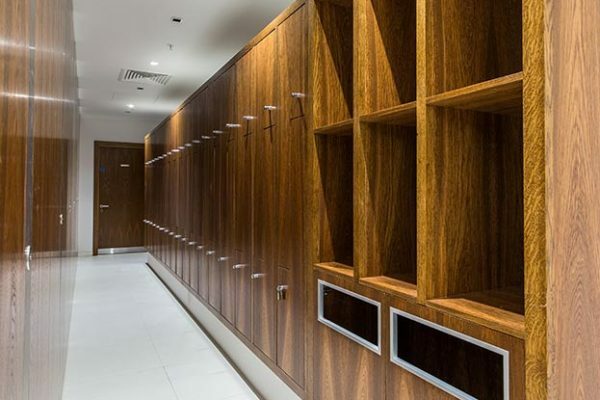 For the staff shower and changing area, we installed our high specification Octave lockers which were finished in the same dark oak real wood veneer as the toilet cubicles to continue the design. Each spacious shower room is completely self-contained with a bench and free-standing glass shower cubicle housed behind a standard door creating a changing area more akin to a luxury leisure facility. We also supplied and installed all sanitaryware, including pans, urinals, sinks and taps, as well as all ancillary items, including toilet roll holders and even the shoe-shining machines for the project.